Click here to go to my YouTube video. 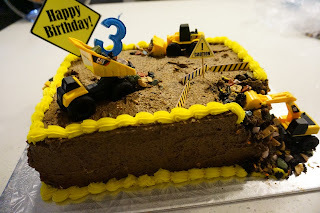 If you need a few ideas on how to decorate for your kid's construction theme birthday, keep on reading after the jump or click on the picture to the left to be re-directed to my YouTube video. In my video you will see a quick tutorial on a DIY paper decoration as well as a brief explanation of how I made the cake.